Digital Marketing Trends 2019 - Digital Marketing : Social media marketing, research, news and more! As we all know that digital marketing trends are steadily changing, We have some predictions on digital marketing trends in 2019, but can’t be sure. Here are the leading digital marketing trends in 2019. 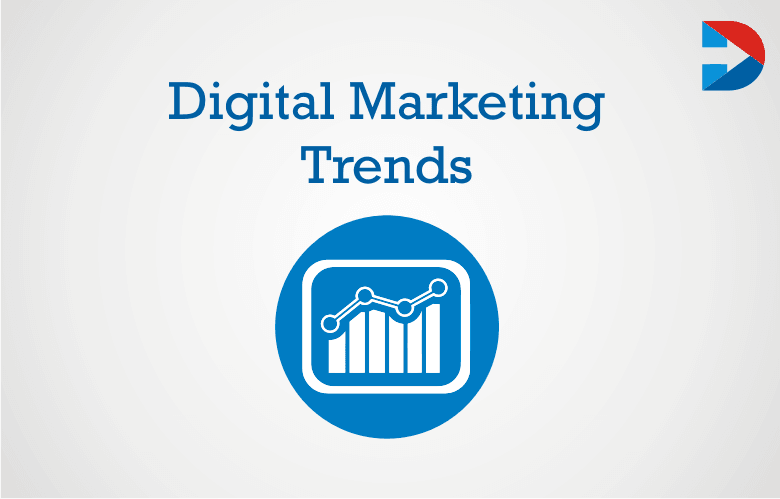 Digital marketing is evolving by every minute with brand new technologies. In 2018 digital marketing changed its landscape drastically, new innovative changes in algorithm across all marketing channels with the acceleration of voice search and AI marketing. Voice Search is now trending in Digital marketing world. Forecast marketing revealed that by 2020, 50% of the search would be voice searches in search marketing. The search marketing is emerging in all smart devices and mobiles phones. It is easy to use, hands-free and convenient to use. The rise and rise of smart devices, AI integrated smart home devices vice search are dominating the business campaigns and following down of SEO marketing. As a marketer is a right time to incorporate Voice search as a part of SEO friendly strategy for promotions, introduce long tail keywords, special pages for FAQ sections for providing answers to voice search based queries. Alexa or Google Home are the best examples of Voice search devices. According to statistics, 64 million voice-based devices are in offices and home in the US by 2019. With the help of Machine learning, AI and Automation technologies work can be done more accurate and faster. But it doesn’t do your job automatically, need some human boost up to push buttons. In 2019, digital marketing campaigns wholly relay on chatbots. These small bots do your job more efficient and faster. Nowadays customers are more comfortable taking with smart devices or non-humans. Chatbots are refurbishing the online experience. Form the survey, adults aged 18-64, more than 70% of the people are attentive to talk with chatbots for sophisticated communication with brands. 85% of the customer interaction will be dealt with the Chatbots by 2020. Chatbots will be progressive for everyday demands like online orders, booking hotels and tickets, getting reviews of products. Chatbots acknowledged for open communication route between you and your customer 24×7 and 365 days. Many companies are incorporating Chatbots for efficient and fast customer service with minimal time for B2B and C2B communication. The power of mobile technologies overreaching all other digital marketing trends. Mobile Marketing should be forefront in digital media strategies 2019. Mobile marketing is only possible your website should be responsible for SEO friendly marketing. Early 2018, Google launched mobile first indexing. From that time search engines will increasingly index responsive and mobile friendly versions. That means mobile-friendly content will be more recognizable on search engines. More than 34% of the online purchases acknowledged from mobile devices. Personalized mobile ads, mobile first content and sending cross mobile messaging are key ingredients in mobile marketing. The offline purchase also have more impact on mobile marketing. 82% of the people first check on mobiles before any online purchase. 72% offline sales come from mobile searches. Native ads are social media ads that formally displayed as posts and stream as updates users timeline. Native ads display on social media in the form of Facebook ads, Instagram ads, Snapchat, and Twitter ads. We TOLD you guys not to let your pets watch Olympic gymnastics! Native advertising allows you to tell a story about your brands that lead to more engagement to connect with the audience to convert customers to conversions. These native ads enhance your customer engagement, click through rate and conversions. Video Marketing is the fastest growing and providing new opportunities to assist audience engagement. More than 81% of the marketers using video in their marketing campaigns. More than 72% of the marketers say that Video marketing has increased their conversion rate. Consumers revealed, they shared 70% of brand videos for promotions and Watching product video enhance their confidence level for buying the product. Coming to video trends, Live Video also gaining more popularity businesses implementing Video trends in their campaigns. Many businesses involving live videos in their strategies for Events promotions, Interviews, product demonstrations and behind the scenes. Other than YouTube, Live Videos, 360-degree content also more interactive to the consumers. Video SEO is also gaining more popularity in video marketing. Stay top in the competitive world, Quality content remains incredibly significant in content marketing. Every content marketer should be aware of content trends up to the minute. Long-form content, voice search, visual content leading in the content marketing 2019. Endless changes in Google search algorithms, instead of focusing on keywords pay attention to content clusters around a particular topic. In content cluster pillars, cluster and hyperlinks play a vital role. Pillars and clusters are interrelated with hyperlinks. If one page performs well, the entire cluster will get bootup. Artificial Intelligence notify the consumer’s behavior to help the businesses how the users are adopting social media apps, blog posts curious on their product and services. We can choose Facebook Messenger bot as best example which will be helping to automate and optimize the customer services experience. By 2020, 25% of the customer service will make by Chatbot technology by Gartner. It’s a prediction that all business in 2019 will adopt Artificial Intelligence to save the costs and enhancing the conversion rate stay ahead of their competitors. 2018 was a big year for Influencer marketing, influencer marketing brought incredible changes in brands and raised consumer demand for brands. Influencer marketing is nothing promoting your brands through word of mouth through third-party influencer. Rather than marketing directly with the significant number of consumers, focusing on key leaders to drive the brand message to the larger group. Influencer marketing tool can attract more customers through the influence of celebrities, bloggers through social media channels like Instagram, Facebook, and Twitter as a word o mouth marketing. Generally, people trust the consumer’s review rather than corporate ads, and statements. Continue Honesty and Transparency with the clients or consumers is a significant essential trend in 2019. Nowadays Brands no longer rely upon label or name to sell the products. The Young generations want to know all the product details they purchased at the same time knowing where they are coming from. Transparency in business has become an era of digital marketing trends. Communicating with the clients should be honest in brands campaigns. Many companies already incorporated the transparency in their digital marketing strategies. These are the sprinkling digital marketing trends that we saw leading in 2018 and believe that will continue in 2019 to change the landscape of digital marketing. Keep all these trends in mind while implementing the digital marketing strategies in 2019.